The obituary of Lawson S. Rentz (1890-1970) provides a follow-up on this former Ray City, GA resident (see Lawson Rentz Serves Country and Ray City, GA). Lawson S. Rentz, a son of William P. Rentz and Emmaline Parrish, was born May 15, 1889 in Lowndes County, Georgia. He married Clyde Lee Daniels on June 11, 1913 in Berrien County, Georgia. Rentz was a First Lieutenant, Medical Corp, during World War I. He served in the Embarkation Service at Hoboken, New Jersey and afterward returned home to enter medical practice as one of the Medical Men of Ray’s Mill. In the 1920’s, when the marketing of the “American tropics” reached a heyday, Dr. Rentz was swayed to make a trip to Florida. 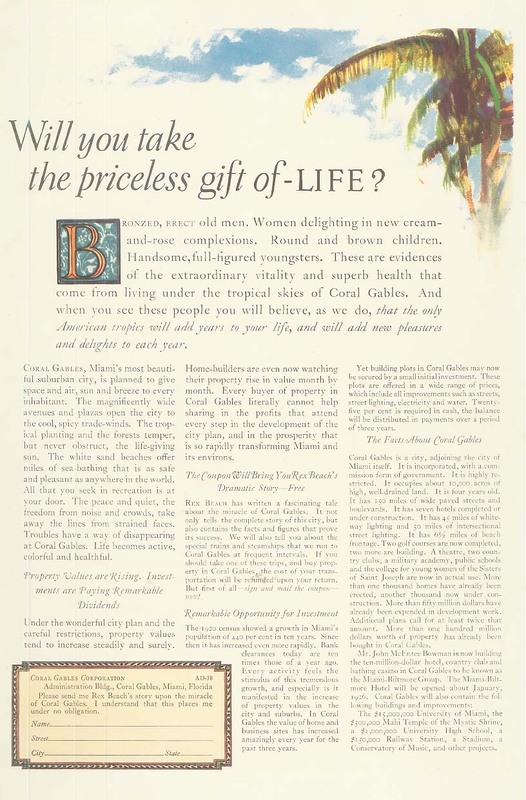 The dream of paradise in south Florida was the brainchild of George Edgar Merrick (1886–1942), a real estate developer who is best known as the planner and builder of the city of Coral Gables, Florida in the 1920s, one of the first planned communities in the United States . George Merrick is also credited with the establishment of the University of Miami in Coral Gables in 1925 with a donation of 600 acres of land and a pledge of $5 million dollars. Will you take the priceless gift of -LIFE? Bronzed, erect old men. Women delighting in new cream-and-rose complexions. Round and brown children. Handsome, full-figured youngsters. These are evidences of the extraordinary vitality and superb health that come from living under the tropical skies of Coral Gables. And when you see these people you will believe, as we do, that the only American tropics will add years to your life, and will add new pleasures and delights to each year. The doctor did take a train, and found south Florida quite to his liking; he spent the rest of his life there. He died March 26, 1970 in Dade County, Florida. Dr. L.S. RENTZ – age 80 of Coconut Grove, Fla., died of lung cancer in March of 1970. He had lived Miami for 44 years. A former resident of Nashville and Ray City, Dr. Rentz was lured to Miami by a promotion scheme devised by developer George Merrick, who sent trains up and down the East coast, promising anyone along the way a free trip to Florida in exchange for looking over his properties there. Dr. Rentz hopped on, and decided to stay. Survivors, Dr. L.S. Rentz, a pharmacist, lives in Miami; Dr. D. Frank Rentz, an orthodontist, also of Miami; his wife, the former Clyde Lee Daniel; 1 Daughter – Mrs. Annie Laura Carlisle of Cairo, Ga., 2 sisters- Mrs. Effie Griffin of Tampa and Mrs. Arlie Futch of Adel.